Warwick School will be running a range of fun short courses and Super Choice activity days over the Easter holidays, with activities including wall climbing, African drumming, cookery, handball, dance, Mini Zoo, chess, swimming, pottery and much more! Open to all children from Reception to Year 7 (up to and including 12-year-olds). 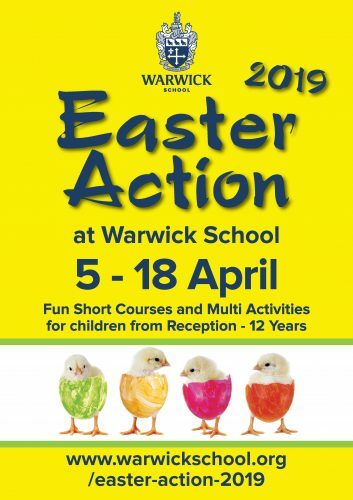 For further information or to book a place, please visit https://www.warwickschool.org/easter-action-2019 . Please visit our website here to see the fun short course activities and our additional services. The information on our site includes dates and times of courses, age ranges, examples of activities included and costs. Please note that our activities are arranged by school year group. Our Cygnets group is open to children in Reception and Year 1. Additional services (Early Birds Swim, Cygnets Early Risers, and Night Owls) are also available. Night Owls (4.30 – 6.00pm) includes tea. Our newly refurbished pool has now reopened! Please see our website for information on which of our activities include a fun swim. If a course is marked as ‘fully booked’, please email Jo Wong at Jo.Wong@warwickschools.co.uk if you would like to be added to the waiting list. Lunchtime supervision will be provided for any children booked onto both a morning and afternoon fun short course (Please bring a packed lunch). Posted on January 28, 2019 by Nikki. This entry was posted in Companies, Holiday Clubs In Warwickshire.